Accommodation. The region is known for the hospitality of its inhabitants, which visitors can enjoy while staying in one of the traditional houses that can be found along the trail in all three countries. The variety of accommodation ranges from traditional stone houses, so called “Kulas”, to mountain huts and small mountain lodges where local and home-made dishes are served by the local hosts. Whenever possible, it’s highly recommended to book in advance to ensure a place to stay. Food and Beverages. As the trail leads partly through uninhabited mountain regions and hikes are sometimes quite long from one accommodation to another, it´s highly recommended to always carry enough water and food with you. Grocery stores are very rare and can only be found in bigger villages or small towns such as Pejë or Shkodër. Marking and Signposting. 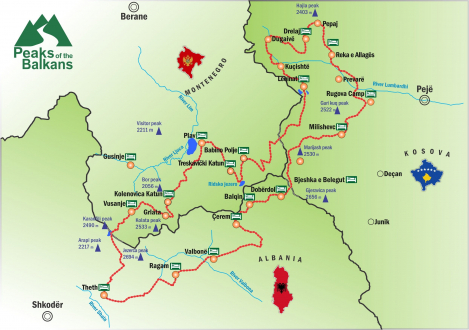 The whole Peaks of the Balkans trail is marked with the following marking systems and the Peaks of the Balkans signposting set up, all along the trail. rubbish to the nearest bin!